In this chapter, we follow Attaleiates’ journey, late in his teen years, toward Constantinople. We board with him a merchantman and discuss life at sea for the medieval traveler, following on the wake of his vessel as he visits a number of sites on his peregrination toward Europe’s medieval Gotham, the capital of the empire, Constantinople. 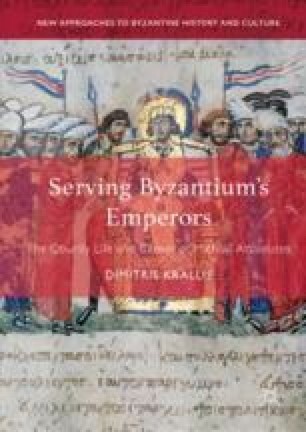 Attaleiates soon integrates himself in the city’s educational scene and we meet with him the main figures animating Byzantium’s intellectual life in the eleventh century, discussing the competitive spirit that marked Byzantine schooling. While in Constantinople, we walk with Attaleiates down the city’s main avenues and follow his daily trajectory from home to work, taking in the city’s changing scenery and urban landscape, considering its people and their lives.